There appears to be such angst if people get something wrong, make a mistake, or misunderstand something, that for some reason the repercussions will be horrendous! 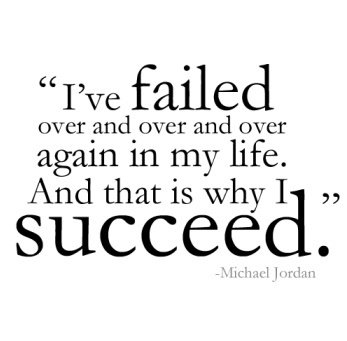 I would suggest that failure can actually help us! The truth is that failure gives us the humongous opportunity to learn so much from our mistakes. It offers us reactive learning and is also a very effective way to build up our experiences and ideas. The term “Trial and Error” highlights this. We try something out and if we make the mistake or it doesn’t work, then we take that fact on board and learn from it. The only difference when we think about doing something in this way is our mind-set – naturally if we think of something as a trial we are subconsciously more relaxed if any errors are made. But not everything we do in our workplace and in our day-to-day lives gives us the opportunity of having a trial at it first. What is important though is that we understand that things might not work first time! We need to be able to embrace these things that go wrong rather than fear them. Just remember that all failure can offer intrinsic value! Even without the luxury of a trial. It is a great action instigator and is an effective way to get people to listen to why change might be necessary. We only need to look at Retrospectives… Those that work in an Agile environment regularly get together to discuss the positives and negatives about the previous iteration. I’ve been in more than a fair few retrospectives and I find that “sad face” column very valuable because of the fact that it offers us the opportunity to learn as a team from anything that we felt went wrong, plus it stems our actions for change to put those things right. It offers us the motivation for improvement! And another aspect of how failure can help us is that it also offers us the opportunity for storytelling. If we notice our mistakes and make a conscious effort to learn from them, then it gives us great stories to tell. Not just of the mistakes we’ve experienced, but also of how we’ve actually learned from the mistakes and overcome them. And in turn, this offers other the opportunity for proactive learning for the audience of the story – they can learn from your stories and proactively avoid falling into the same traps! So rather than fear failure, embrace it and learn from it. It really can help you! Previous postLessons Learned from Agile Testing Days (Day 3)! Next postTesting in the pub podcasts are now here!! I’m all for embracing failure and learning from it, but I think we should be cautious of advocating “trial and error”. There’s a big difference between testing a hypothesis (and accepting that the outcome may be failure) and randomly doing things while hoping for the best – the latter is rarely beneficial. I think it can be very useful in certain circumstances. Take for example if i am asked to learn about some new software before i might be asked to test it… If there isn’t any documentation and there isn’t anyone available for me to talk to about it to ask questions, then my best way to learn about the system in this context is to use the software, play with it. But without knowing about it when i start playing with it, then I’ll utilise some randomness! Trial and error can be useful, there’s no doubt about that. But like all activities, it carries an opportunity cost – and it can be easy to get sucked into “playing around” with something (be it software, a test technique etc) until long after you’ve picked up all the immediately useful lessons from it. From that point on, you’re effectively wasting time. As an aside, I quite like the term “galumphing” and it’s quite a handy technique, but I’ve always thought that they were tiny, inexpensive actions – not something you set out specifically to do (though I guess there’d be nothing wrong with that, if you thought it would yield results that would justify the time spent). All that said, another good blog post on a very interesting theme. I’ve been thinking about failure recently as well (due to work circumstances), so I think I’ll follow your lead and write about it.